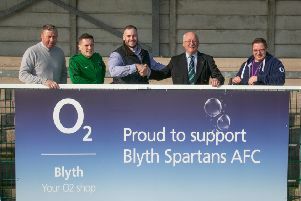 Dan Maguire was the Blyth Spartans hero on Tuesday night as the striker smashed his second hat-trick for the club as they beat already relegated Trafford. Substitute Craig Lynch set a late seal on the win as Tom Wade’s side played their opponents off the park with an ultra professional performance. Blyth were almost handed the perfect start as Michael Richardson came within an inch of giving his side the lead in the sixth minute. The midfielder found a yard of space on the edge of the Trafford area and managed to get a left foot shot away, however, he could only curl it against the top of the bar. There was to be no let off three minutes later and again it was Richardson who was at the heart of the action as he released Maguire in on goal. The striker took a touch before rolling the ball past the advancing Tom Read to give his side the lead. However, it was a lead they only hold for four minutes as Liam Blake got the hosts back on level terms. Danny Parker was caught in possession by Trafford striker Mark Derbyshire and then won a challenge with Stuart Bramley. That gave the striker a chance to roll the ball to Blake and his first-time effort took a deflection off Bramley and looped over the helpless Nick Thomson before nestling in the back of the Spartans net. Spartans could and should have retaken the lead midway through the first half as Richardson and Maguire combined once again. This time it was Maguire who played the role of creator as he beat Chris Palmer down the left before rolling back to Richardson 12 yards from goal but he could only blast a left foot shot wide. Richardson had another golden chance minutes later as a miskicked clearance from Adam Jones looped up on to the head of Robbie Dale and the Spartans skipper headed back into the Trafford area and it was met by a first-time volley by Richardson but he sent it over the bar. Spartans were on top but were frustrated again on the half hour mark. Maguire was again lively and after being released down the left by Dale picked out a wonderful cross to the back found that found the head of Damen Mullen but he was denied on the line by keeper Read. Despite their dominance of possession, Tom Wade’s side could have fallen behind shortly after Mullen’s chance. A scramble on the edge of the Spartans area saw the ball fall to Trafford right back Palmer and he rocketed a shot towards the top left hand corner but Thomson was alert and parried to safety. But Blyth’s pressure finally paid off three minutes before the break as Maguire struck once again with a wonderful effort. He worked himself away from two defenders before curling home from inside the area with the ball creeping just inside the near post. With the clock ticking into injury time, Maguire came within a whisker of another as he rose to meet a Stephen Turnbull free kick from the left and flicked a header towards the far post but saw it drop agonisingly wide of the upright. That miss meant Spartans only took a one goal lead into the interval. Spartans continued their dominance into the second half, roared on by calls of ‘keep possession’ from their dugout. That was what they did five minutes into the half and their possession should have lead to an increase in their lead as a wonderful passing move involving five players ended with Rivers rolling in Richardson but the midfielder’s powerful rising effort was parried away by Read. The hosts’ first chance of the second half came 20 minutes in as Blake played his strike partner Derbyshire in on goal and although he was pressured by Matthew Wade he managed to send a shot into the side netting of Thomson’s near post. The imperious Maguire continued his relentless quest to get a hat-trick and he came within a whisker when he closed down Trafford keeper Read and the ball smashed off Maguire and drifted just past the near post. That hat-trick did come with ten minutes left, and again it was Richardson who played Maguire in on goal. The striker skipped past Read and calmly rolled the ball past two defenders on the line, to the joy of the travelling Green Army behind the goal. Injuries forced Spartans into changes, and when Stuart Bramley was forced off, Dale was played as an emergency centre half, a role he took to like a duck to water, showing the relaxed nature and decisiveness that has been the hallmark of his 11 years with the club. The pressure did not relent and another goal came in the final minute of injury time as substitutes Ash Davis and Craig Lynch combined for the latter to tap home from close range to set the seal on a seriously impressive and professional performance from Wade’s side. On Saturday relegation threatened Marine come to Croft Park, with Spartans needing to better Ilkeston’s result at Nantwich Town to sneak into the Evo-Stik Northern Premier League play-offs. Blyth Spartans: Thomson, Mullen, Turnbull, Bramley (Wearmouth 55), Parker, Hooks, Rivers (Davis 88), Richardson, Maguire, Wade (Lynch 80), Dale. Subs not used: Bell, Nicholson.